When San Francisco streets are opened up to people for Sunday Streets, the influx of foot traffic brings a host of health and economic benefits to the city’s neighborhoods, according to findings presented by Dr. Susan Zieff, a professor of kinesiology at SF State University, at a Board of Supervisors committee hearing yesterday. Zieff and her team surveyed 600 Sunday Streets participants at events 2010 and 2011, collecting data that makes a strong case for investing in open streets events. One of the data points we reported in late 2011, for instance, is that every dollar spent on running Sunday Streets yields an estimated savings of $2.32 in medical costs. The studies “have been really invaluable to us,” said Tom Radulovich, executive director of Livable City, which organizes Sunday Streets with help from city agencies. The top reason people come to Sunday Streets, said Zieff, is to enjoy the city’s streets in a way that’s impossible at nearly any other time, when the space is primarily reserved for traffic and parking. “Over and over again, people talk about being able to walk down the middle of the street with their families, do physical activity in a safe environment, not to worry about vehicle traffic, and generally be around people who are having a good time,” said Zieff. In Zieff’s survey, 51 percent of participants reported coming from outside the neighborhood, and the average participant traveled 3.25 miles, round trip, to the event. Among those who had attended Sunday Streets more than once, 25 percent reported an overall increase in physical activity since they began participating in the events. And, Zieff noted, the ethnic demographics at Sunday Streets are generally representative of the city as a whole, meaning the events appear to be effective at increasing physical activity among African-American and Latino residents, who tend to suffer the highest rates of cardiovascular disease. During each event, 44 percent of businesses report an increase in customer activity and sales, with an average increase of $466 in net revenue along each route, said Zieff. As Sunday Streets organizers have reported, merchants who initially resisted Sunday Streets for fear of losing business are now clamoring for the events to come to their neighborhoods. Although restaurants have reported an overall decrease in walk-in customers on event days, shops and other types of businesses generally see an increase. Merchants that hold outdoor activities to engage with participants at the events — just under 20 percent of those surveyed — reported an average jump in business of two-thirds. The influx in business also means more available work, as one in five businesses report increasing their staffing for the event, said Zieff. A total of 70 extra employees, on average, were scheduled to work at businesses along Sunday Streets routes compared to regular Sundays. That means “more employees, more salaries, more income to spend and so forth across the city,” said Zieff. At the most recent Sunday Streets event, held in the Dogpatch and Bayview neighborhoods last weekend, a number of restaurants on Third Street that are normally closed on Sundays remained opened for business, said Rebecca Gallegos, manager of public relations and fundraising for the Bayview Opera House. 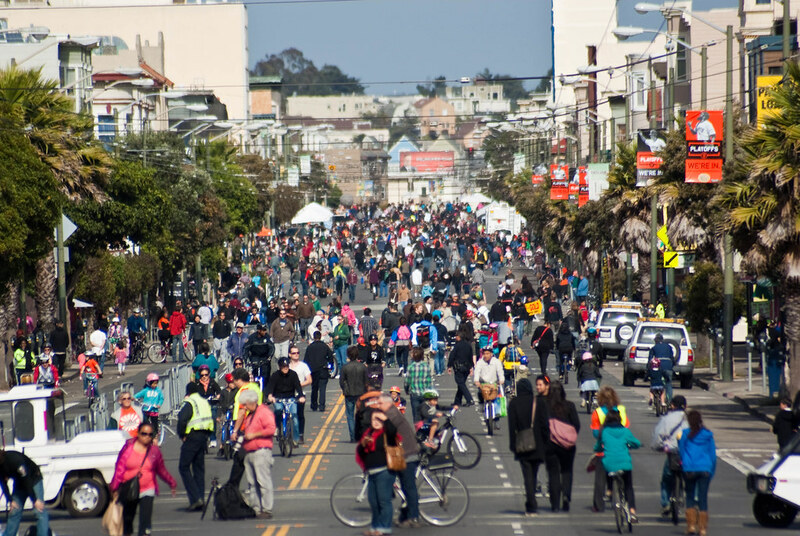 Even after a Sunday Streets event is over and streets are once again the dominion of cars, Zieff noted that there are lasting benefits that aren’t as easy for researchers to measure, such as the increased sense of community, and the effect of discovering a new neighborhood. Remember when we were getting ready to roll the first of these out and people were saying it would kill business? I agree that Sunday Streets brings in a lot of business to the Mission or Chinatown. However, many of these events are in areas with few businesses open on Sundays, such as the Embarcadero or Great Highway or Tenderloin. I was especially surprised about the Tenderloin Sunday Streets which did go through Little Saigon, but all the shops there were closed that day. Maybe Sunday Streets can do more outreach to local businesses that are normally closed on Sundays and encourage them to open that day? Or maybe bring Sunday Streets to neighborhoods that do have businesses open on Sunday. Half the fun of Sunday Streets is enjoying a neighborhood that we don’t normally visit, including the businesses in that neighborhood. Eventually people do get the message. Outreach before the event is good, but if Sunday Streets becomes regular and predictable– when business owners see (or hear about) how many people were out at Sunday Streets and can prepare for the next time– then momentum builds. The Tenderloin Sunday Streets was sad because, in addition to hardly publicizing it beforehand (within the neighborhood), they never came back. Haven’t we had street fairs since forever? The report seems far less promising than its author or this streetsblog article would aver. Specifically, some businesses increased sales and employee hours, probably by opening on Sundays, while others (restaurants — normally open on Sundays) lost business. More tendentious still is the claim that attendees are becoming more active and healthy by attending one or more Sunday Streets events. The study’s author reported that 25 percent of respondents believed they were becoming more active. That is an untested data point. In fact, calling such wishful self reporting a data point at all is absurd from a scientific standpoint. The social scientist who authored this study and the journalist who regurgitated this drivel should duck for shame. No doubt Sunday Streets is a good idea–the photo shows a LOT of people out enjoying the day. What I question is the estimate of $2.32 worth of medical costs for every $1.00 spent on providing the necessary city services. This would seem to be an impossible figure to prove; $2.32 is a rather precise-looking amount for a matter that is by its very nature difficult to quantify accurately. I suppose that if the $2.32 appears at the bottom of a numbers-filled chart with a lot of arcane definitions and acronyms, it might impress dollar-obsessed city officials, but many of us take such estimates with the proverbial grain of salt. Additionally “44% of businesses experienced in increase in revenue” suggests up to 56% of businesses experienced a decrease in revenue. What matters isn’t the average revenue increase of businesses which experienced an increase, but rather the net average revenue increase (or decrease). The intent was clearly to show there is a possibility for revenue increase in what car-centric fear viewed as a universal threat, and businesses which exploit the opportunity can do well, but the article should be more balanced in its statistics. Yeah, I noticed that as well, but there could be a percentage with no noticeable increase/decrease or it wasn’t reported. We can’t necessarily assume 56% of businesses experienced a decrease in revenue. I went to the most recent Sunday Streets on Third Street and tried to grab a snack when it was finished and the café I went to had been sold out of half of their menu so I’m surprised restaurants often see a decrease in customers. Can someone please post a link to the report? Bogotá, Medellín, Colombia, Guadalajara, México, San Francisco, USA. $1.02–$1.23 for Guadalajara, and $2.32 for San Francisco. Sunday Streets returns to the Tenderloin on August 18, 2013. It does not. Is there anywhere the economic information is publicly available?